Imagine being able to sleep indoors after playing outdoors all day. This Clipper camping trailer 1285SST Classic allows you to sleep on a king tent end bed while the kids sleep on a queen tent end bed. 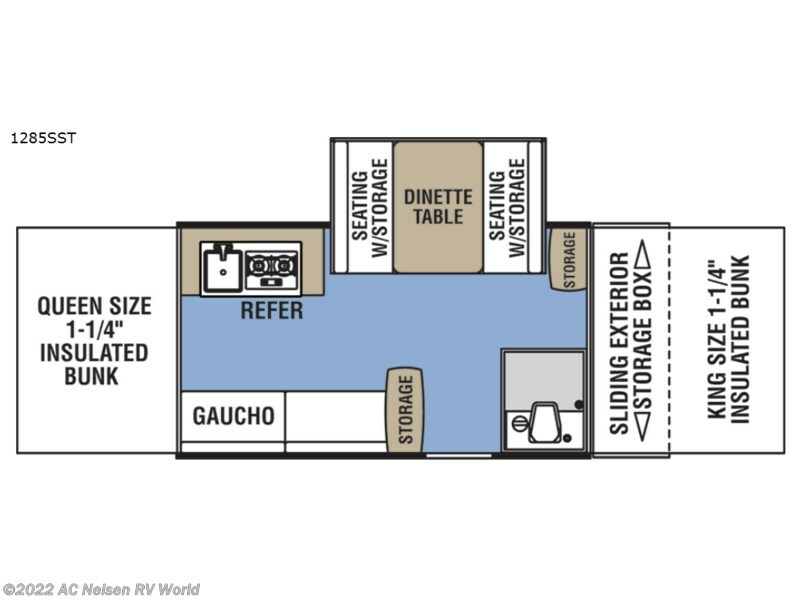 If you brought friends, you can fold down the dinette within the single slide out, and the gaucho may fit a sixth person if needed. You can even cook meals, and stay clean thanks to the wet bath. Take a look, you will be glad you did. Camping got a lot easier thanks to the Coachmen Clipper camping trailer. Each model is easy to set up, use and store. From the Canimex dual drive/dual purpose winch and drill bit which raises and lowers the roof in under 30 seconds when used with a cordless drill, and the scissor-style stabilizing jacks that extend and retract easily to the exclusive "Glide-N-Lock" cable supported bed system, 100% adhesion residential grade linoleum, and walnut cabinetry you will enjoy a Clipper camping trailer for many years. Come choose your favorite floorplan today! Check out Stock # 15710 - 2018 Coachmen Clipper Camping Trailers 1285SST Classic on coachmenrvsource.com!